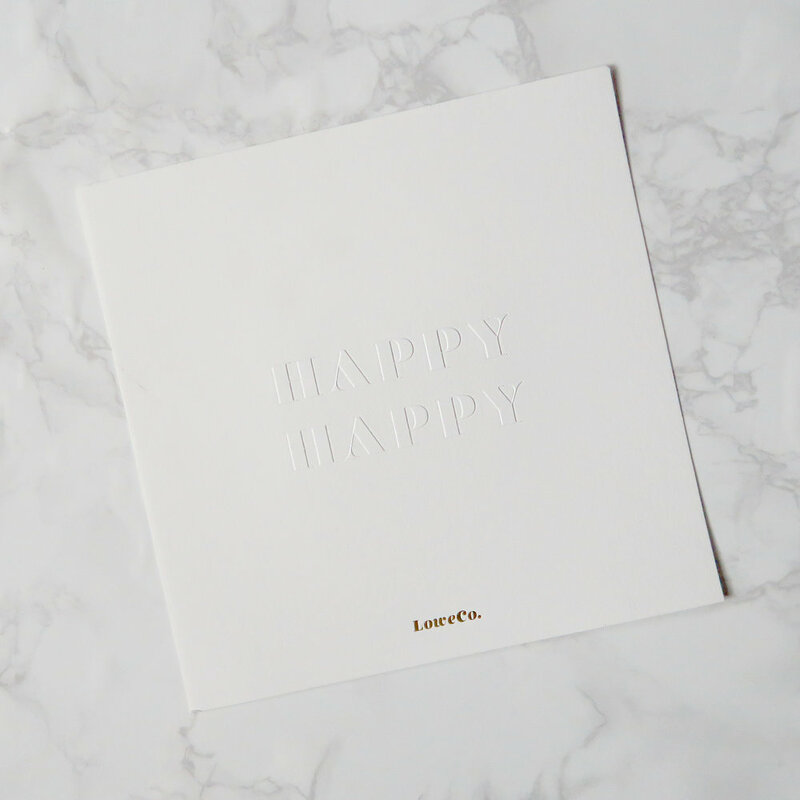 NEWEST & NOTEWORTHIEST — LoweCo. Our New LARGO cards are gonna be HUGE. Frame-worthy, crowd-pleasing, statement-making cards. Our new 8x8 inch cards are meant for big groups but are perfect for a card-giver that loves leaving a great (big) impression. LoweCo. now features cheeky cards in poco (3x3” folded), macho (5x5” flat) and largo (8x8” flat) sizes — all for your different gifting needs. Our smallest size is meant to be hand-snuck, our middle size is meant for you to divulge and our now biggest size is meant to be celebrated. ISN’T SHE LOVELY Originally created to celebrate Mother’s Day in honor of Catherine’s mother. HAPPY HAPPY One of our most popular sayings in all three sizes and our most popular in our seasonal Cards That Grow™ collection. YOU’RE THE VEST I SHOES YOU This saying was of the original five messages available to LoweCo. at its inception and was inspired by Catherine’s love of fashion. These cards are appropriate for all types of occasions but for our most popular suggested ideas, refer to our matching game below. Our giant cards are accompanied by a giant envelope and two postage stamps if you’d like to snail mail them. (Yes, the USPS mails just about anything if you slap enough postage on it.) 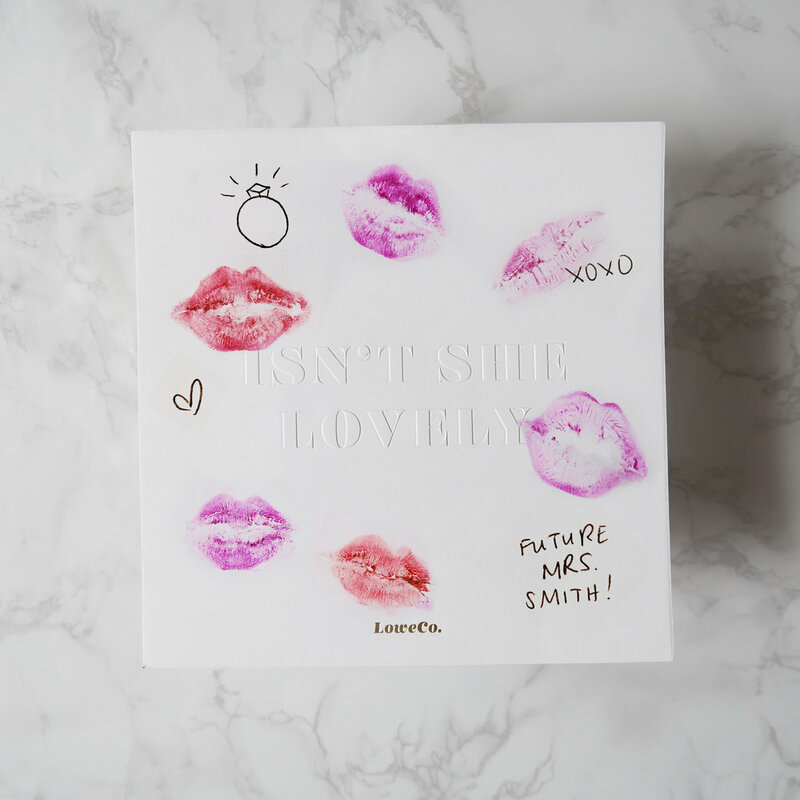 There is also an opportunity for you to gift this size with an acrylic, magnetic frame or a hand-decorated faux pearl white frame to truly commemorate the occasion. Largo cards make a lasting impression and will be cherished with the memory of all that have signed it. Shop our Largo cards as individuals, paired with our acrylic frame or within our faux-pearl frame.